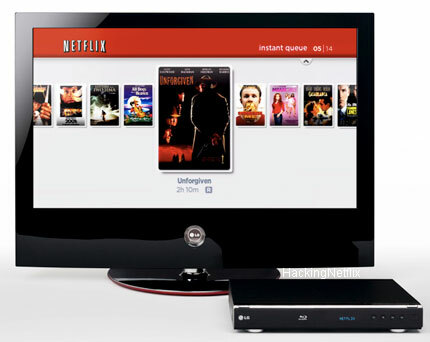 LG tonight officially announced the LG BD300 Blu-ray Disc Player with support for Netflix movie streaming. Available this fall, the LG BD300 supports BD Live, BonusView, and 1080p up-converting, and will cost "well under $500." 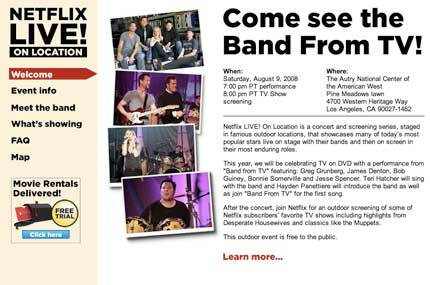 Netflix will be hosting a live performance of the "Band from TV" and a screening of popular TV shows in Los Angeles on August 9th at 7pm. This year, we will be celebrating TV on DVD with a performance from "Band from TV" featuring: Greg Grunberg, James Denton, Bob Guiney, Bonnie Somerville and Jesse Spencer. Teri Hatcher will sing with the band and Hayden Panettiere will introduce the band as well as join "Band From TV" for the first song. If you're interested in attending, more information is available on the Netflix Live! On Location website. 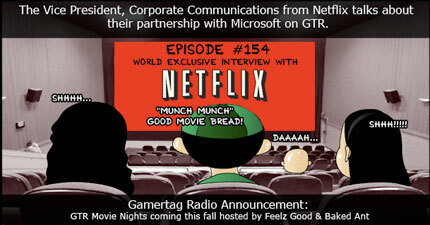 The Gamertag Radio has posted an audio interview about Netflix & the Xbox 360 with Steve Swasey, Netflix's VP of Corporate Communications. The interview starts about 21 minutes into the podcast. Variety reports that the MPAA is putting together a website to tell consumers where they can legally find a movie. This will come in handy due to the different release windows, exclusive deals, and different viewing options (pay-per-view, download-to-own, rental, and subscription). Currently unnamed site would let users search by film title and then provide links to options including purchasing theatrical tickets, buying or renting the DVD and legally downloading the pic. All of the major studios are expected to support the site, which fits into the MPAA's overall strategy to fight online movie piracy. According to a studio source, the new website is a response to research that found consumers sometimes have trouble differentiating between legal and illegal ways to watch and buy movies via the Net. It's believed that the site will link to any legit partner. That could benefit Netcos ranging from Fandango to Netflix, Apple's iTunes and Sony's PlayStation Store. Click here for the full list of new releases this week (125). Interesting movies this week include Stargate Continuum, Shine a Light, Centennial: The Complete Series, Harold and Kumar Escape from Guantanamo Bay, Inglorious Bastards, Never Back Down, Tai Chi Master, The Lost Boys: The Tribe, Dark City Director's Cut, Joe Louis: America's Hero Betrayed, Surfwise, Baldwin Hills: Season 1, Witchblade: The Complete Series, and Two Fat Ladies: The Complete Collection. Netflix CEO Reed Hastings said that Netflix would begin testing a Blu-ray price increase "very shortly." He also said that a small percentage of users ("low single digits") currently rent Blu-ray titles, but they expect that to increase this year with the introduction of low-cost Blu-ray players during the holiday season. What do you think is a fair premium for Blu-ray titles? Netflix CEO Reed Hastings announced during the earnings webcast that they now offer more than 12,000 movies and TV shows for Watch Instantly, up from 2,000 when the service launched 18 months ago. Update: Seeking Alpha has posted a transcript of the earnings webcast. "We are pleased to announce another quarter of strong financial results," said Reed Hastings, Netflix co-founder and chief executive officer. "This quarter we delivered 25 percent year-over-year growth in subscribers, our lowest SAC ever as a public company, and a 14 percent increase in EPS for the quarter. And we made important progress on our strategy of offering our subscribers the option of streaming video directly to their TVs with the introduction of The Netflix Player by Roku(TM) in May and the announcement earlier this month of our agreement with Microsoft to embed Netflix streaming capability in the Xbox 360 video game and entertainment system." Netflix ended Q2 with more than 8.4 million subscribers, adding 168,000 net subscribers. Q2 revenue was $337.6 million, up 11% over Q2 2007 and 4% over Q1 2008. Gross margin was 31.8% in Q2, up slightly over Q1. Subscriber acquisition cost declined slightly to $28.95. Churn was 4.2%, up slightly from Q1. GAAP net income was $26.6 million. 9.1 to 9.7 million subscribers. $1.364 billion to $1.379 billion in revenue. GAAP net income of $75 million to $83 million. GAAP EPS of $1.19 to $1.31 per diluted share. Has Roku Sold 100,000 Netflix Players? Dan Rayburn on The Business of Online Video reports that Roku has sold almost 100,000 Netflix Players. Since publication of the article, I've now learned that the accurate number of units sold is closer to 100,000. While it surprised me the number was that high, it does seem possible, as that would equal about 1% of Netflix's 8.2 million customers. Considering the price point ($99) and the fact that the product's marketing is very focused, to a targeted audience, Roku's penetration rate would be higher than the average product that has only been on the market for eight weeks. Plus, once you have the Roku box, the content is free. Interesting tidbit from the story: Apple has sold less than 400,000 Apple TV's in 20 months. Brier Dudley from the Seattle Times reports that Netflix CEO Reed Hastings is buying Microsoft stock, Xbox deal must look sweet, Netflix boss buying Microsoft shares. Hastings acquired 53,300 shares today in five separate blocks, at prices ranging from $25.54 to $25.60, or about $1.36 million combined. Hastings now has 177,000 shares of Microsoft, according to a Securities and Exchange Commission filing. Hastings is a member of Microsoft's board, and the story reveals an interesting tidbit: "As part of their Microsoft compensation, directors annually receive stock awards worth $120,000."